I’ve decided to keep it pretty simple today. Before I started the #write31 days challenge, I started a series on this blog called “Sunday Blessings.” I have kept a list on my phone because I didn’t want to double post on any of the days if at all possible. So today’s list is my blessings list up until today. Keeping a list has really made me appreciate the blessings in my life. It is something that my Mom has really taught me; to be thankful for the ways that I have been blessed by God. May you all be blessed as well! (3) Spending time with awesome peeps at Beer and Hymns. (6) Having CT send two containers of taco soup home with me. Ive got the best friends in the world!!! (7) Being asked by a seminary classmate and friend to come and talk about the different rosters. I couldn’t go so I’m making a video for them. (8) All my new Bloggy friends from the #write31days challenge. (9) A simple Happy Friday and Enjoy the Sunshine text from my good friend CT.
(10) Reading the latest People magazine. Fun to catch up every once in awhile; a fun guilty pleasure! (12) My friend EG texting me and asking my thoughts on a theology question. It’s so amazing to me. I’ve come along way since my seminary days! (14) Clothes to try on from my friend EG. (16) Being asked by a seminary classmate to come talk to their call committee about the different rosters. I cannot go so I’m making them a video with the help of our media guy. Thanks so much KD!! (20) Western ND LYO–getting to hang with some absolutely beautiful amazing people. (23) Awesome Practice Discipleship adult action track with JH! (25) Talking to my BFF JT on the phone. It’s been way too long!! (26) Getting a phone call from EG; having her share how my seminary professor NF has such nice things to say about me. (30) A beautiful Bible verse shared with me by a colleague/friend. It was just what I needed to hear. (31) A little boy randomly giving me a hug when he got to worship this morning. So sweet!!! (33) My momma (As I blog throughout the month, I have realized even more how blessed I am and am so thankful for our journey to be able to share it with others and walk with them. I found this image today while getting ready to type and I love it so thought I would share. 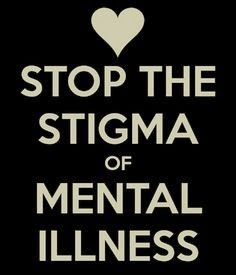 May we continue to stop the stigma associated with mental illness. And one last thing, today we were blessed to have in worship the band Heart River Child from Mandan ND. They are a talented group of musicians from Mandan ND. They performed one of my all-time faves this morning so thought I would share their rendition of “I’ll Fly Away” with you. See you tomorrow my dear readers and friends!